Trusler, hailed by The Times as “an authentic, though British, virtuoso”, performs as a recitalist and concerto soloist throughout Europe, Australia, the USA, Japan and South Africa. He plays a 1711 Stradivarius and uses one of Heifetz’s own bows. Yasuo Shinozaki has a fast developing international reputation and he has conducted many of the major orchestras in the UK, Europe and Asia. The Düsseldorf Symphony Orchestra has a long and fascinating history and counts Mendelssohn, Schumann as past Music Directors. The Orchestra performs around 250 concerts per year throughout Europe, China and Japan. It’s difficult to think of anything in the world of violin playing, from the 20th century onwards, which hasn’t been influenced by Jascha Heifetz. Whether it’s the art of violin playing itself, or the music composed as a result of his towering presence, one cannot imagine the violinistic landscape of today had Heifetz not made his famous Carnegy Hall debut in 1917, any more than one can had Paganini not had the impact he did in the early 19th century. In fact, Korngold himself explained that Heifetz was a perfect mixture of Paganini and the great singer Caruso- ideal for his violin concerto which he was concerned should not be treated as merely a pyrotechnical display. As one of the most successful film composers in Hollywood, Korngold knew how to compose music which was instantly evocative, anything but only technical, and the lush orchestration and effortless melodies of his violin concerto are, literally, straight out of the movies. But Korngold’s talents were, especially in his early childhood, recognised as being extraordinary. Growing up in Vienna during the early years of the 20th century, he was hailed as a child genius to rival Mozart by such heavyweights as Mahler, Strauss and Puccini, with his early works premiered by artists including Artur Schnabel and Carl Flesch. It was thanks largely to his being a Jew during the second World War that Korngold arrived in America to compose the first of his 21 film scores. This caused huge distress to his father, who saw it as a talent wasted. The following years proved hugely successful for Korngold, two of his scores receiving Oscars, and a further two being nominated. Actors including Eryl Flynn and Ronald Reagan starred in films he scored. But Korngold clearly missed the high regard in which he was held as a young composer of ‘serious’ works, and from the late 1940s decided to focus again on music for the concert hall. The violin concerto was the first of these works. However, as a composer who in general disliked the more dissonant inclinations of his peers, Korngold’s compositional style was still well rooted in Hollywood. Each movement quotes from a different one of his movies, and the overall impression is of pure, late romantic melody. Heifetz, always having an eye for the popular, (his extracurricular activities included writing for and performing with Bing Crosby,) premiered the concerto in 1947. Miklos Rozsa, born in 1907 in Budapest, was a prolific composer of film music, scoring over 100 movies and receiving an astonishing 17 Academy Award nominations whilst winning three times. Also suffering the hardships of a ‘serious’ composer writing in Hollywood, Rozsa referred to Kornold, along with himself, as being a musician of a type which was not often found in their industry. Like Korngold, Rozsa had considerable success in the concert hall, his works being conducted by Bernstein and Solti among others. Deeply influenced by the music of his homeland, Rozsa’s violin concerto is very Hungarian in style, and reminds one of Bartok- a man Rozsa only met once but admired greatly. It is also filled with the influences of Hollywood, and was later reworked into a film score- for The Private Life of Sherlock Holmes in 1970.
operatic arias, piano pieces and broadway show tunes into virtuosic violin miniatures. Although the Jamaican Rumba on this disc was arranged by William Primrose, Heifetz performed and recorded it, and the transcriptions of Estrellita and Jeanie are very much his own. Hailed by The Times as “an authentic, though British, virtuoso€ Matthew Trusler graduated from Philadelphia’s Curtis Institute of Music in 1998. Following the release of Matthew’s disc Blues The Daily Telegraph declared that “Trusler assumes the Heifetz (and Perlman) mantle with ease€. A passionate lover of the style and approach to violin playing during the Heifetz era, Trusler performs with one of Heifetz’s bows, given to him by Herbert Axelrod (who himself received it from Heifetz). Trusler has a particular affinity for the composers of that period, receiving much acclaim for his performances of concertos by Walton, Berg, Britten, Prokofiev and Korngold. Matthew Trusler has been invited to perform as a recitalist and concerto soloist throughout Europe, Australia, the USA, Japan and South Africa. In the UK he has performed with most of the major orchestras, and has appeared further afield with the Minnesota Orchestra, NDR Hanover, Helsinki Philharmonic, Deutsches Symphonieorchester Berlin, Malaysian Philharmonic and Johannesburg Philharmonic. Some highlights include tours with the Australian orchestras (including appearances in Perth, Queensland and Tasmania), a tour of Germany with the Academy of St. Martin-in-the-Fields and Sir Neville Marriner, and a tour of Mexico with the Philharmonia Orchestra and Martyn Brabbins. Alongside his concerto work Matthew Trusler is an accomplished recitalist and an avid chamber musician. 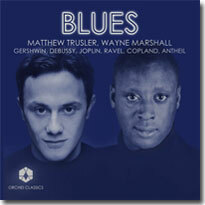 Trusler has performed frequently with Wayne Marshall, and the duo’s recent disc Blues presents a collection of short pieces by composers directly influenced by jazz. The CD was released to huge critical acclaim, including CD of the week in the Telegraph, CD of the week on Classic FM, and Recital CD of the month in Strad Magazine. Collaborations with other eminent musicians have included Piotr Anderszewski, Martin Roscoe, Peter Donohoe, Imogen Cooper, Leonidas Kavakos, Lynn Harrell, and Joseph Silverstein. Trusler has performed recitals in leading venues around the world including the Wigmore Hall in London, the Auditorium du Louvre in Paris, and the Palais des Beaux Arts in Brussels. In addition to performing and recording, Matthew Trusler has founded a record label, Orchid Classics, and a foundation raising money for ill babies, The Lenny Trusler Children’s Foundation. He also recently acted as an consultant on the screenplay being adapted from Norman Lebrecht’s award winning novel, The Song of Names. Matthew plays a 1711 Stradavarius. In a remarkably short time, Yasuo Shinozaki has acquired a truly international reputation for his emotionally direct style of music making. Born in Japan, he studied in Vienna, Siena and the United States, came to prominence in Finland, and spent three successful years as Assistant Conductor of the Los Angeles Philharmonic before making his home in London. He has also scored notable success in his homeland. Yasuo Shinozaki studied conducting with Leopold Hager at the Vienna Musikhochschule, with Myung-Whun Chung at the Accademia Musicale Chigiana in Siena, and with Seiji Ozawa and Bernard Haitink at Tanglewood. In 2000 he took second prize at the Second International Sibelius Conducting Competition, directing the Helsinki Philharmonic in a memorably emotional performance of Sibelius’ Second Symphony. Also in Finland he has worked with the Turku Philharmonic, Finnish Radio Symphony Orchestra, Tampere Philharmonic and Tapiola Sinfonietta. In January 2007, Yasuo Shinozaki was appointed Chief Conductor / Artistic Director of the Kymi Sinfonietta based in Kotka and Kouvola in Finland, and continues his position with them throughout this season. As Assistant Conductor to Esa-Pekka Salonen at the Los Angeles Philharmonic between August 2001 and September 2004 Shinozaki conducted more than 40 concerts. In addition to subscription concerts in the Walt Disney Concert Hall, Shinozaki conducted the orchestra on regional tours and at the Hollywood Bowl. Shinozaki also performed with the Los Angeles Philharmonic New Music Group. Yasuo Shinozaki’s extensive work in Japan includes engagements with the Tokyo Philharmonic, Nagoya Philharmonic, Osaka Philharmonic and the New Japan Philharmonic and he has conducted at Japanese opera houses including the Tokyo Nikikai Opera and Japan National Opera, where he made his opera debut with Mozart’s The Marriage of Figaro. In the UK he has worked with the Bournemouth Symphony Orchestra, Southbank Sinfonia, BBC Scottish Symphony Orchestra and BBC Philharmonic. Other orchestras which have engaged him in recent years include the Hong Kong Philharmonic, Frankfurt Radio, Wuerttemberg Philharmonic, Swedish Radio, Vasteras Sinfonietta, Norrlands Symphony, Nuremberg Symphony Orchestra, BIT20 Ensemble (for the Ultima Festival), Johannesburg Philharmonic Orchestra and the KwaZulu-Natal Philharmonic Orchestra. The first Music Directors in Düsseldorf included Felix Mendelssohn-Bartholdy (from 1833-1835) and Ferdinand Hiller (from 1847-1850) who were already highly acclaimed during their own lifetimes. It was Ferdinand Hiller that urged Robert Schumann (in Düsseldorf 1850-1854) to accept the position of Düsseldorf’s Music Director. It was of great importance to the city of Düsseldorf that it was able to persuade Robert and Clara Schumann, who were already regarded as world famous at the time, to remain in the city. In spite of his incurable disease, Schumann composed many of his best works here. It was the first and last time that Schumann held public office which meant that Düsseldorf €“ alongside Leipzig and Berlin €“ was regarded as one the most important cities of music in Germany at the time.